The Holiday Gift Checklist will help you accomplish all of your holiday shopping with style! This template is unique because it makes you reflect on the reason why you want to buy someone a certain gift. Other gift checklist templates just have you enter your gift ideas and not much else. This template gives you a place to really think about your gift and gives you the opportunity to choose something both meaningful and thoughtful. Now you have the chance to make this year one your friends and family will remember for the rest of their lives. Download this free Gift Checklist to help you choose the perfect gift for everyone you know and love! Start by clicking on the link located at the bottom of this page to download the free Event Checklist! The next step is to write down all your gift recipients under the “Person” column. Make sure to include everyone you plan on buying a gift this year. The template also gives separates your gifts into various categories. After you enter a category, then you are free to list the actual name of your gift idea under the “Product” column. 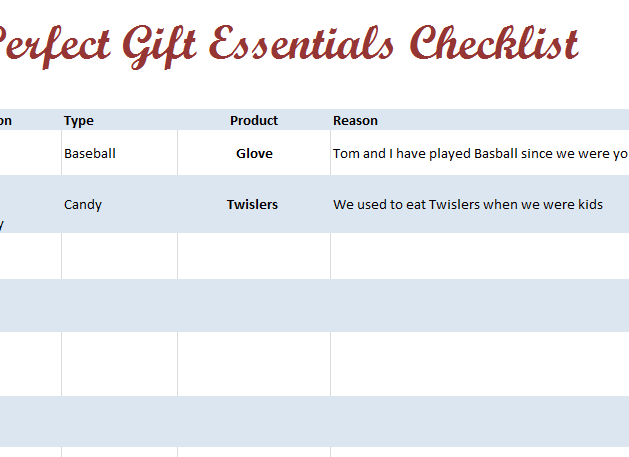 The next column is what truly sets this Gift Checklist apart from others. The “Reason” column is where you will write why you are choosing this specific gift. Now you have the opportunity to reflect on your gift idea and really choose something sentimental or meaningful to give your loved one. Making the people closest to you happy is really what the holidays are about. The five sections after the “Reason” column are to help you organize your gifts and everything else that goes along with holiday shopping. These columns allow you to list: if the gift has a sentimental factor, the location where you can buy the item, if you have already purchased the gift, if you have wrapped the gift, and finally the price of the item. Once everything has been entered into all of the columns, you’ll be ready to print your list and have it conveniently on hand wherever you go! Simply press the “File” tab at the top of your screen, then select “Print” from the drop-down menu that appears. Master your holiday shopping this season with this simple and elegant template! By using this amazing template, you can give the people you love very thoughtful gifts this holiday season. Nothing is better than a gift from the heart and that’s exactly what’s behind the design of this document. It’s simply the most organized and efficient way to choose the perfect gift for someone. Don’t let holiday shopping stress you out, use this checklist to make a huge impact on someone’s holiday this year!